The guideline for our clients to have an idea of how to make the booking with Easy Tour China. I plan on taking my wife, my daughter (16) and my son (9) for 5 days trip to Hubei this April. One of my highlights is to visit Wudangshan and Three Gorgeous Dam. We are coming from Los Angeles. Would you please put together a tour package for our family of 4. We will be arriving Wuhan on April 1 and leaving April 6. Thanks for inquiring your family trip to China with us. Wudangshan is a famous Taoist Mountain and also noted for Taichi, which are two important Chinese traditional culture. Our travel consultant will contact you soon via email. I would like to go on a tour of most important tea places in China and have an authentic tea experience, learning to make tea, gong fu cha, about Jixing clay and Pu Erh... but I am not sure if it would be possible to adjust the 20day tea tour. I would take out day 2 and 3 but the rest seems interesting. Thanks for contacting Easy Tour China. Our 20-day China tea discovery sample tour includes some sightseeing. This tour can be tailored to your specific interests and appetites. Our tea tour specialist will be in touch with you via email asap. 2 nights - 13/15 Oct 17 - GUangzhou - Pax attending 122nd Trade Fair Phase I - half day city tour on 14 Oct Afternoon. Accommodation with breakfast - preferably near vegetarian restaurant. Free shuttle hotel to trade fair required. Thank you for visiting and requesting. The 122nd Canton Fair is from 15th October, 2017 to 4th October, 2017. Phase I is from 15th to 19th October. Our travel special ist will reach you soon regarding details of the trip. i like to visit shanghai a china city to see idustrial trade fair in november 2017 for one week. do you have any tour packages.i m from hyderabad india.send details. Greetings from Charlie and thanks for visiting! We have some day tours for Shanghai and nearby places like Suzhou, Wuzhen or Zhouzhuang Water Towan, etc. If you can spend 2-3 days for the trip, Huangshan Mt. and Hangzhou are highly recommended. Our travel specialist will reach you soon via email regarding the details. Kindly sent me the quotation for 2 guest on twin room. The quotation should include the transfers to and fro airport in Guangzhou,ground transport during the tour and hotel in 2-4 star. Thanks for contacting Easy Tour China. We are so pleased to be of service to you. Regarding the tour in Guangzhou, our travel specialist will be in touch with you soon via email. How much per night Tong An Hotel at Wuzhen? As to your hotel inquiry, we would recommend you to check with other hotel booking websites. Hope you can understand it. Thanks for visiting Easy Tour China. 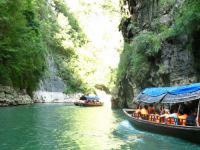 For details of your China tour package, our travel specialist will contact you via email asap. Have a nice day! I want "kaifeng one day trip"
.. From my hotel at luoyang train station. Please kindly note that currently our office is closed due to the National Day holiday until Oct 7. If you arrive after that date, our travel specialist can be in touch with you soon via email. We are more than happy to be of service to you. Regarding the trip details you requested, our travel specialist will be in touch with you soon via email. We are more than happy to be of service to you. As to your family trip to Beijing, our travel specialist will be in touch with you soon via email. Would like to get general information on costs for 2 adults, 2 children (age 15 and 4) for Family Triangle 9- day tour, coming from Atlanta, Georgia. Timeframe would be summer 2017. We are more than happy to be of service to you. As to your family trip to China, our travel specialist will be in touch with you soon via email. I am Najwa from Malaysia is keen to have your service for travel in Shantou for 3 days. We will landing on 25th March and off to Malaysia on Sunday. I am glad if you can assist us with travel information for 3 days 2 night with the quotation. We are very glad to be of service to you. Regarding your trip to Shantou, our travel specialist will be in touch with you soon via email. Hi, we (6person) will be in zhuhai on 15/03, do you have a day tour to all places in zhuhai. may I know the total cost? We are very glad to be of service to you. As to your trip to Zhuhai, our travel specialist will be in touch with you soon via email. could we (4 persons) have one day trip from Nanning to Detian Waterfall? If Yes, What could be the total price of this trip? We are very glad to be of service to you. Regarding your trip to Detian, our travel specialist will be in touch with you soon via email. Hi is there a tour of nanning that can be done in one morning? And is there any for Beijing for one night? Our travel specialist will be in touch with you soon via email. We are so glad to be of service to you. I am afraid that during the period we don't have a group to join in for your Guangzhou trip. For more travel info, our travel specialist will be in touch with you soon via email. Hi there I am looking for a tour of China starting in Shanghai ending in Beijing, we would also like to go to Xian and Chengdu if possible. Please let me know the cost of the trip and everything that is included and not included. We are so pleased to be of service to you. Regarding the tour details, our travel specialist will be in touch with you soon via email. To visit the tipical thinks. I would like a similar travel as this. Also I am going to Shanghai next April if you need to go to any pat to speak about this. We are so pleased to be of service to you. Regarding your trip inquiry, our travel specialist will be in touch with you soon via email. Hi-i contacted you a few weeks ago regarding a stay in Beijing. We now have a plan. We arrive on 10th April on Sapphire Princess cruise ship. We will be staying for 4 nights at Novotel Beijing Xinqiao. We would like to be met at cruise ship- how much would a transfer be? 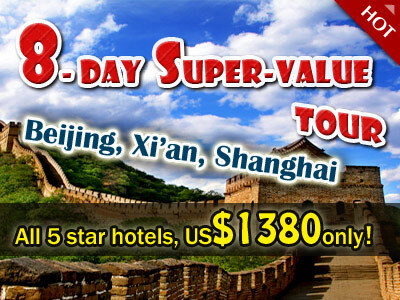 We would like to visit Tiananmen Square, Forbidden City, Summer Palace, Great Wall at Mutianyu and possibly aviation museum. Happy to travel by coach with other travellers. Look forward to hearing from you. We are so pleased to be of service to you. As now it is during the Chinese Lunar New Year holiday, I am afraid that our travel specialist may not reply you so promptly as usual. Hope you can understand it. Have a nice day there. We will be in shantau for 3 days in end of oct.Do you operate shantau city tour etc.please recommend.we are 2 people and will need ernglish speaking guide. Also please let us know if they have shantau city tours. We are very glad to be at your service. Shantou is a unique city located in East Guangdong Province. It has rich cultural heritages, especially at its neigboring Chaozhou city. For more tour details, our professional travel consultant will be in touch with you soon via email. Please kindly note that from October 1-7 our office is closed due to the National Day holiday. Possibly we can't give you the accurate price so soon. Hope you can understand it. But we are so sorry that we can't help you this time if you will visit the Ming Tomb and Purple Mountains tomorrow. Possibly you can take Subway Line 2 and get off at Xiamafang Station (下马坊站), and walk to the entrance of the Ming Xiao Ling Museum; or take bus line 20, 315 or sightseeing bus line 3 to go there. Wish you a pleasant trip there! Luoyang is also a famous ancient capital like Xian, really worth a visit. Shaolin Temple and Longmen Grottos are the must-see attractions of Luoyang. Our professional travel consultant will be in contact with you soon via email. we are 75 years old vegetarian indian couple. we will also like to take 8-10 days tour of mosco, st. petersberg and helsinki near about the same time. we have indian passports and will need visa assistance. Thank you so much for the inquiry. As a professional travel company based in China, Easy Tour China is so happy to be of service to you. Our travel consultant will be in contact with you soon via email. Greetings from Ricky Yang, Easy Tour China. Thanks so much for your inquiry. Our professional travel consultant will be in touch with you very soon. Sunny greetings from Ricky Yang, Easy Tour China. Many thanks for your inquiry. We are very pleased to provide you with the travel information you requested. Our professional travel consultant will be in touch with you very soon via email.